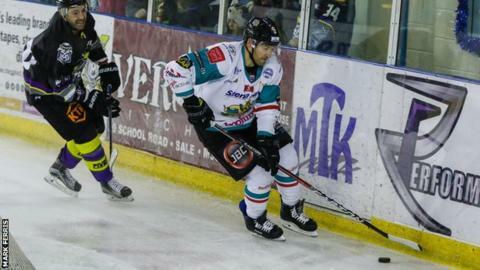 Belfast Giants scored two late goals to clinch an Elite League victory over Manchester Storm in England. Mike Hammond put the hosts in front but Belfast hit back with goals from Jim Vandermeer, David Rutherford and Sebastien Sylvestre. Mate Fleming and Hammond netted to level the game and Blair Riley restored Belfast's lead before Matt Beca equalised early in the third period. Riley and Steve Saviano struck in the final two minutes to win it. The victory sees the Giants move into joint first place, level on points with the Cardiff Devils and Nottingham Panthers. Hammond opened the scoring as he converted a 3-on-2, assisted by Beca and Scott Pitt, at 14:42. With only 2:11 gone in the middle period the Giants equalised through Vandermeer's slapshot from the blueline, assisted by Sylvestre and Colin Shields. Little over three minutes later and the visitors had the lead with Rutherford slamming the puck home at 25:35 after a pinpoint pass by Ryan Martinelli. The Giants purple patch at the start of the second period continued when Sylvestre gave the Belfast side a two-goal advantage at 26:46, assisted by Shields. Fleming pulled one back for the Storm at 31:27, scoring a rebound on the powerplay assisted by Gerard Hanson and Like Moffatt. Hammond's second goal of the game was an equaliser at 35:12, assisted by Moffatt and Linden Springer. However, it was the Giants who would have the final say in the second period as Riley finished well while shorthanded at 38:55 to edge the away team in front. Beca gave the Storm another equalising goal only 58 seconds into the final period, assisted by Dallas Ehrhardt and Hammond. Riley's second goal was the game winner, with the captain firing into the Storm net at 58:44, assisted by Darcy Murphy and Rutherford. Steve Saviano made sure of the win with an empty net goal at 59:48. The Giants will hope to make it a weekend double on the road when they take on Sheffield Steelers on Sunday.